On the Monarch Butterfly Trail in Mexico: "Explosions," Joy and "Hasta la vista en Texas!" Monarch butterflies are on their way to Texas right now. Hopefully we’ll have milkweed for them when they arrive. My Mexico-savvy husband, Robert Rivard and I visited the oldest and newest sanctuaries of the Monarch butterfly roosts in the Mexican mountains last week in a four-day, back country butterfly sojourn that leapfrogged expectations and surpassed all cliches. Over the years, I had seen videos of cascading Monarch butterflies ending their winter diapause. in the remote mountain folds of Michoacán, Mexico. I had also read descriptions of orange butterfly clouds fluttering in blue skies. In 2005, I made a midwinter visit on horseback through the snow to El Rosario, the first of the Monarch Butterfly Biosphere Preserve sanctuaries. That spontaneous trip from San Miguel de Allende to the preserve near Angangueo disappointed. Snow was falling with temperatures hovering near freezing as we arrived. 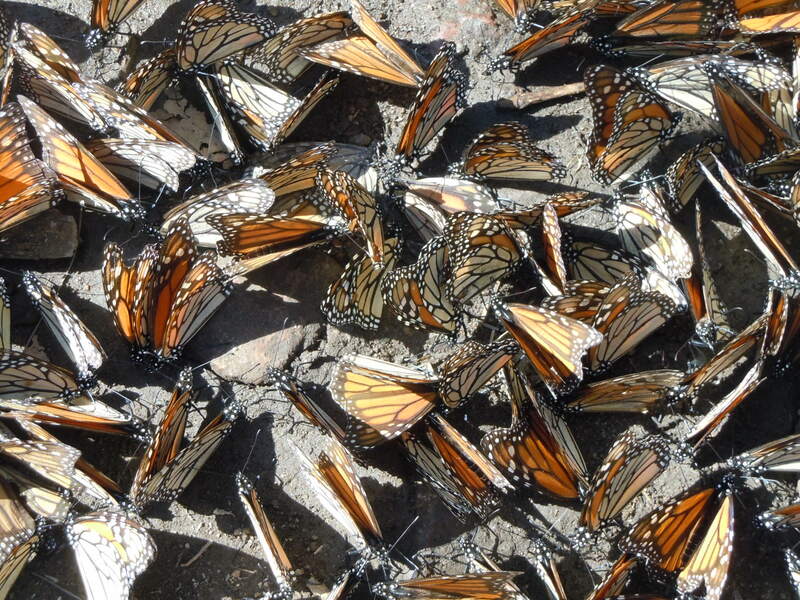 Tens of thousands of dead Monarchs covered the forest floor. The trip left me depressed about the Monarch population and missing the exuberance described by other sanctuary pilgrims. The visit was also a stark contrast to what we experience along the Llano River in the autumn when we tag hundreds of Monarchs migrating south from Canada and the American heartland, our small annual contribution to the Monarch Watch butterfly monitoring program. But this voyage to El Rosario could not have been better. Our amiable, sure-footed guide, Maria Gloria Cruz-Gonzalez, led us on a 45-minute hike to the ancient oyamel tree forest at almost 10,000 feet. The first Monarch was spotted only nine minutes into the climb, and butterfly density increased with every step. An hour-and-a-half into our morning, we witnessed a dramatic stream of Monarchs in the air, and crowding the branches, leaves and trunks of the huge firs. Soon we found ourselves several yards from one of the oyamel firs, just as the first butterfly “explosion” occurred right in front of us. That’s what the renowned Monarch scientist Dr. Lincoln Brower called the advent of millions of Monarch butterflies reaching a tipping point as the morning sun warms them. Suddenly, they rise up from their roost in an amazing synchronous flight, filling the skies with a joyous rush. Watch the video above to get an idea. Bob and I decided we didn’t like the word “explosion” because it was too violent. Our newfound butterfly friend, Bill Toone of the EcoLife Foundation in San Diego, calls it a “butterfly fall, because they fall off the trees.” A “butterfly wave” “cloudburst” and “rush” also capture the experience. Our struggle to find words to explain the sight doesn’t diminish the memory. We found ourselves laughing giddily and some in the crowd were moved to tears. I didn’t think it could get any better but the following day we visited Cerro Pelón, or Bald Hill, the newest Monarch butterfly sanctuary. Apart from its massive butterfly appeal, Cerro Pelón, located in the town of Los Macheros, is only a 30-minute drive from the Rancho San Cayetano, the only option in nearby Zitacuaro for those who command sophisticated hotel accommodations after a day on the trail. Proprietors Pablo and Lisette Span could not have been more hospitable or knowledgeable, and have hosted many amateur and academic lepidopterists over the years. They have stories. Plus, the food is locally sourced, expertly prepared and served family style in the San Cayetano’s welcoming dining room, where Monarchs make an appearance as art in stained glass windows and woven tapestries. Cerro Pelón offered a completely different kind of butterfly high. Following our brief drive, we mounted horses for the 90-minute climb up a dust-choked trail, led by local guides who brought us to a beautiful mesa dotted with cupheas, sage and other dry season survivors. We reached the top of the mesa, dismounted our horses and descended into the arroyo on foot. Then the real fun began. In the sky, on the trees, in the bushes, on the ground–butterflies were ubiquitous, floating, flitting, fleeting in fast-moving orange masses. Walking along the dry creek, we watched as millions of butterflies rushed ceaselessly in the sun from several oyamel trees, creating a soft-but-steady wing-fluttering soundtrack to the crystal clear day. They puddled in a dripping spring, lighted on bushes and blooms, gently shoved our faces, and rested on our shoulders and hats. The sight of such abundant life is jaw dropping, but careful: you don’t want one in your mouth. Ultimately, the Monarchs sought out mates in the sky, on the ground, in the bushes, and in the trees. We witnessed several “courtship flights” whereby the males lift the females from the forest floor and literally carry them away, locked in a butterfly embrace. Their reproductive mission complete, these same Monarch butterflies will be passing through Texas in the next few weeks. They’ll make their way to San Antonio, Austin, the Hill Country and beyond. The females will deposit eggs on our native milkweeds and continue the ancient cycle. I look forward to seeing them here soon. Hasta la vista, Monarcas. See you in Texas. I am wondering how to get in touch with Maria Cruz Gonzales? I am thinking of a solo trip there. Also I am wondering what time of year you went? I would be thinking about late February. I am interested in a tagging this fall. Can you help? Maybe, Dorothy. What did you have in mind? The best resource on tagging is http://www.monarchwatch.org/tagging. I have tiny 1″ milkweed plants coming up in my yard in Fair Oaks Ranch, Texas. We are ready! Absolutely amazing!! We’d love to put a quote from this post and a link on our milkweed pages. Feel free to link, Emily. It was magical. By the way, the Antelope Horns I bought from you are about two inches tall, some with four leaves. I’m having to supplement with nursery-bought curassavica, as mine is still tiny. Thanks for writing, Mary.